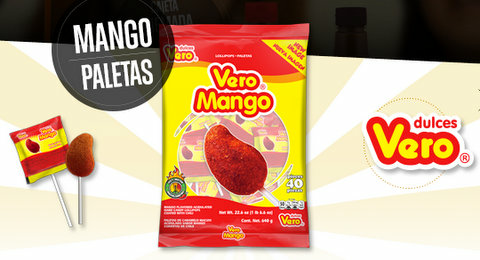 Vero Mango Paletas with a layer of mild spicy chili powder and a sweet mango taste. Tropical mango flavored lollipops with chile. 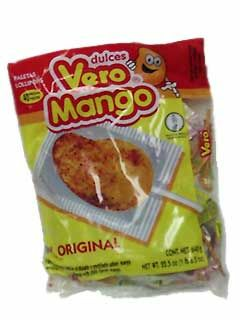 Vero Mango Suckers. Ingredients: Sugar, corn syrup, citric acid, guajillo chili pepper, iodized salt, artificial flavor, artificial colors. Imported by Barcel USA a Grupo Bimbo company. Vero the original. Chili covered mango acidulated lollipop artificially flavored. 60 calories per piece 0 saturated fat, 250 mg sodium (10% DV), 10 g sugars. Paletas sabor mango tropical con chile. Dulces Vero. USED TO EAT THESE WHEN I WAS YOUNGER IN MEXICO, THEY ARE SO GOOD AND PERFECT AMOUNT OF CHILI AND SWEET. Grew up in southern Cali and I remember buying these suckers from the ice cream truck. I now live in Wisconsin where no one has even heard of these candies so I'm glad I can find them online!! I have been eating these since I was a child. I grew up in Southern California, and Arizona, They were everywhere then. Recently I moved to Tennessee, and they are impossible to find there, They are marketed to kids, But I find they are the ideal That time of the Month Candy. I tried these and the chili coating was a bit too much for me. Once you get past the outside, they are delicious. These are good, however, my favorites are still the Chicken Pops. I am addicted to these. The first 15-20 minutes are kinda intense with the chile, but once you get down to where you can taste the mango part too, it's super-yum. To hit Southern California. I love them. I personally haven't tried these, but my customers have said how good and fresh they are. Thank you! I love this candy I love mango and this mix between the mango and spice is great.